About Mortgage Broker: if you're looking for Hamilton mortgages or Burlington mortgages or anywhere in Ontario -- Marie Copeland is a Hamilton Mortgage Broker, Financial Services Underwriter (FSU) and owner of Axcess Mortgage and Loans Financing Co. Ltd., providing you with outstanding mortgage help. On the personal note, I too am a Canadian Immigrant having had the good fortune to come to Canada many years ago. And, I wanted to share with you a bit about my beginning which you may find it interesting. To read about my story and a castle in a small village in Poland, go to the link at the bottom of this page. No matter whether you're buying a new residential home, a swanky condo or a rental property, this is one of the biggest investments you will likely make. A mortgage broker works for you, saving you time and money. Many call themselves mortgage brokers but they are NOT -- ONLY FEW are properly qualified to give you that financial edge. Go to: Why use a mortgage broker instead of a bank link at the bottom of the page and see why you should rely on an a good independent mortgage professional for advice. So what are the mortgage qualifications - who's who? Mortgage Agent - an individual who completed a basic mortgage licensing course and has obtained a license to arrange mortgages under the supervision of a Mortgage Broker. Professional associations CAAMP and IMBA continue to make efforts to upgrade the industry standards for those practicing in the field, by offering various courses. One of these is an AMP designation heavily marketed and promoted by the mortgage broker professional association CAAMP - it can be obtained by paying an annual fee to the association and completing some seminars, lender webinars or attending other residential lender events, etc. There is also an Administrator license for those who administer private, MIC mortgages. The higher the educational qualifications and expertise - the better and more profitable mortgage financing strategies you can expect to get. It's a good idea for you to do a bit of research about mortgage broker educational background and experience - this will lead you to a professional with expertise needed to get you best results for your unique situation. If you want knowledge and expertise, let me put my 20 years of experience to work for you and get you the best mortgage strategies, rates and terms. I have arranged hundreds of mortgage loans for clients, many of whom went to their banks and were turned down. 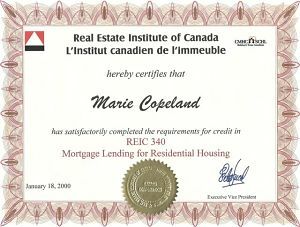 My extensive educational background as a Financial Services Underwriter and years of experience in the mortgage money lending, helps me quickly evaluate your unique needs and match your application to the best mortgage loans available through my network of banks, mortgage companies and private lenders. 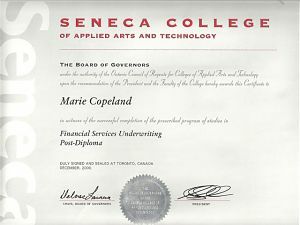 Marie Copeland was first licensed as a Mortgage Agent in 1995 and then a Mortgage Broker/FSU since 2000 after obtaining the Financial Services Underwriting Post Diploma (FSU). Axcess Mortgage and Loans Financing is an independently owned company established in June 2000. We are Hamilton mortgage brokers also arranging Burlington mortgages and throughout Ontario Canada. We specialize in helping people save money and time while assisting them to build their home ownership and real estate investment dreams. Developing first class mortgage strategies combined with excellent service is my commitment to clients and as such, I have a client base with repeat community referrals. You'll often find me involved in community development, assisting local charities with financially stressful community situations. I care about providing excellent and expert service to you, your family, friends and our community. Thank you for visiting my About Mortgage Broker page -- I hope to see you soon. My castle home in a small village in Poland. Every one has their own beginning and I have mine. Why use a mortgage broker instead of a bank ? We work for you to bring you the best mortgage solutions. We can access mortgage products from more than 20 residential lenders to find the right mortgage solution, just for you! Please come back and visit often. I'm regularly making changes to my mortgage resource site. About mortgage broker delivers information relating to the mortgage industry. Just use the easy buttons below to share or add a comment.